Overeaters Anonymous (OA) is a group of individuals who through shared experience, strength and hope are recovering from compulsive overeating, under-eating, food addiction, bulimia, binge eating or overexercising. For more information read the Newcomers section. 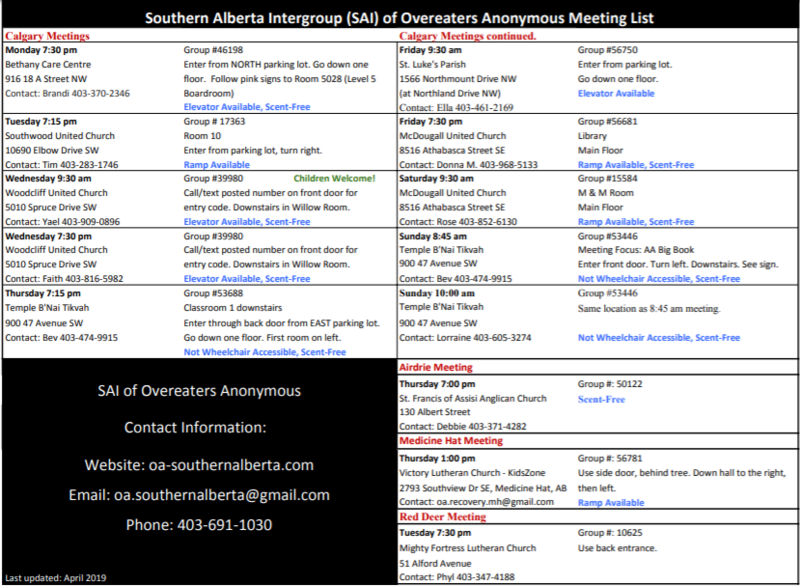 The Southern Alberta Intergroup (SAI) provides support to OA members and groups within Southern Alberta. ​​*NEW OA Thursday Recovery Meeting in Medicine Hat* 1:00 PM Thursdays at Victory Lutheran Church - KidsZone, 2793 Southview Dr SE, Medicine Hat, AB. CLICK HERE for more details. *Big Book 12 Step Study* Please join us at 6:15-7:15 PM, Fridays at McDougall United Church, 8516 Athabasca Street SE, Calgary, AB. *Southern Alberta Intergroup Annual Spring Retreat* Please join us to SPRING INTO ABSTINENCE! May 10, 11, 12, 2019 at Mount St. Francis just outside of Calgary, AB (near Cochrane, AB). CLICK HERE and scroll down page for more details and to register online now! *Northern Lights Intergroup Spring Retreat* May 3, 4, 5, 2019 in Edmonton, AB. For more details go to oaedm.com/events/. Get OA updates right in your newsfeed! 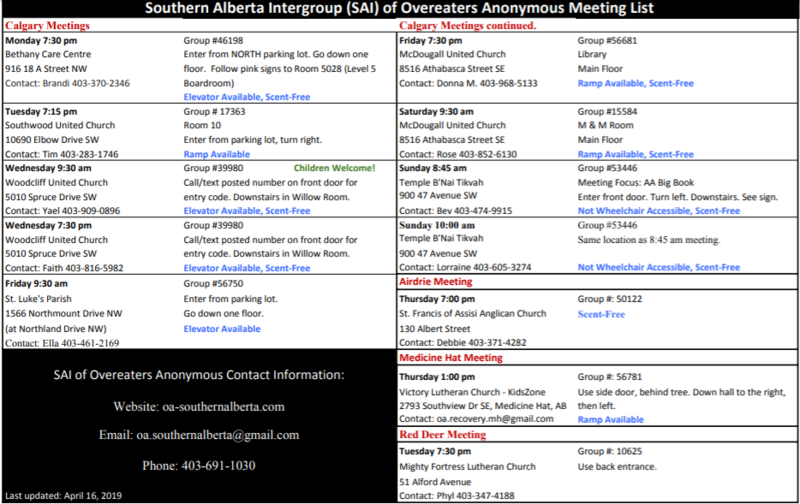 For meetings in Calgary and Southern Alberta please click here to view the meeting list. If there is not a meeting in your area please visit the OA.ORG website to find an online or telephone meeting. Members and Newcomers are welcome to attend ANY and ALL meetings. You do not need to register to attend meetings. If you have questions before attending a meeting please call the contact for the meeting listed on the meeting list or email us using the Contact page. For more information about the fellowship of Overeaters Anonymous and the Twelve Steps please visit the World Service Website using the button below. You will find information, podcasts, videos and links to online, face to face and telephone meetings all over the world.